and yet so far away! There was a time when my life was much the same, Sparkle. The great, amazing outdoors was SO near, but we couldn’t get to it. Then we all ganged up on the humans and became IMPOSSIBLE…Mango was soooo bad, he peed right by the door and then he got to GO OUT! SO I tried it…I SPRAYED right in front of Mom and she finally gave up and now we all go outside. But every day before we go out she tells us she loves us and makes us promise that we’ll come back safe and healthy. Benjamin asked me to tell you that he wholeheartedly agrees. He added a feline sigh, as well and included a dirty look that was meant solely for me. I hear you too, Sparkle. I lived Outside for about 10 weeks when I was a baby with my CatMom and my brofurs and sisfurs, but now it’s all kinda faded. I do like to look out the windows, and sometimes I wish I could go exploring, but we live right smack-dab in the middle of the city and there’s only sidewalk and streets. Sigh. We hear you, Sparkle. We’re inside cats, too! Most times it seems too far away!! like us, you probably have a lot of windows to keep an eye on – keeps one very busy! Sparkle getting near the outside is a constant dream, but I know how great it is to be inside and safe. So I settle for window whiffles to get the feeling of being outdoors. I get that same wistful look on my face when I look outside. I don’t really want to go out, though. It is too scary for me. Kit is an escape artist, though. It’s his fault we gotted microchipped and hafta wear collars. 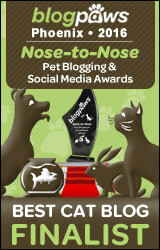 Looking forward to meeting you at BlogPaws! That is a great photo! Scarlett gets the same sort of wistful look on her face when she looks out the window. I think she misses being able to explore outside whenever she wants. We agree with you Sparkle! Today we had to watch Mommy and Daddy working in the yard. They were so near but so far away! Somebody left me outside in the middle of a freezing, snowy winter when I was a kitten. I was starving and cold. I found a great human that took me in her apartment. She fed me and warmed me up. Never again will I go outside, unless it’s to the vet’s. It’s so much safer sitting inside on the window sill looking out during natures nasty elements. Besides, the birdies luck-out from my hunting and are safe also!!! ahhh Sparkle you look wistful. Sparkle, thank you so much for the prizes! They are purrfect. As are you in the photo. The cats are making sure I study and heed the Cat Rules on the bookmark. Thanks again. Great! Especially the part about heeding the Cat Rules. So how’s that Catio coming along? Yup, we thought so. Not so NEAR either! I know exactly what you mean. I made the Woman vote again! Great photo! Have a pawsome day! That is quite and artistic photo, Sparkle. Remember, inside means safer. Very cute hehe. Happy hunting and mine is up. I agree Sparkle, I don’t go out either and it is so near! Shelly says she’s happy that she’s now an inside kitty only, and will happily watch the outside from a window. We send y’all our love. We are happy to know you are an in-door only kitty too, Sparkle! Have a great weekend! I do get to go out, but only on a leash or in my kitter kondo. But I’m only the 2nd kitty out of 4 that got to do so. Sometimes M wishes she hadn’t started me tho cuz sometimes I ask to go out “at the darndest times” M says. when I was first rescued I asked to goout but mommy said I was to be an indoor only baby and I am so glad. There are scary machines out there that could easily hurt a little Tortie or a beautiful supermodel like you. I just love your photo, Sparkle ! I am very glad to be able to go into my catio – but my Britcat brothers and sister who were indoors only in the UK say that indoors only is good when there are risky things outside. But they always sat at the window, wondering. But we don’t have any pictures as pretty as yours of that! Aaah, so very true. We live a life just like you … and there are so many interesting things out there that we can’t get near to. This is a beautiful portrait.I’m also an indoor kitty! The reflections are wonderful in this pic, very well done! Both our indoor kitties sit at the glass doors just like this! Sparkle we loved your package, and there are pictures on my blog, thank you so much!